Subodh Gupta's 'Very Hungry God'. New Delhi, July 1 (IANS) For Indian fans of the football World Cup in Russia, it may come as pleasant consolation that this country will feature at the event, but in spirit alone, with the unveiling of an installation by Georgian-born American artist David Datuna, who is greatly-inspired by the works of Delhi-based Subodh Gupta. Datuna, a conceptual artist focused on the convergence of art and social consciousness, told IANS in an e-mail interview from New York that he is deeply impressed by the installation art of Gupta, who has made a name for himself internationally with his signature style of incorporating everyday objects in his creations. Datuna said he is finishing a series of three installations for the FIFA World Cup — in Russia, on the Korean Peninsula, and in the US — which “will be my peace-making mission”. 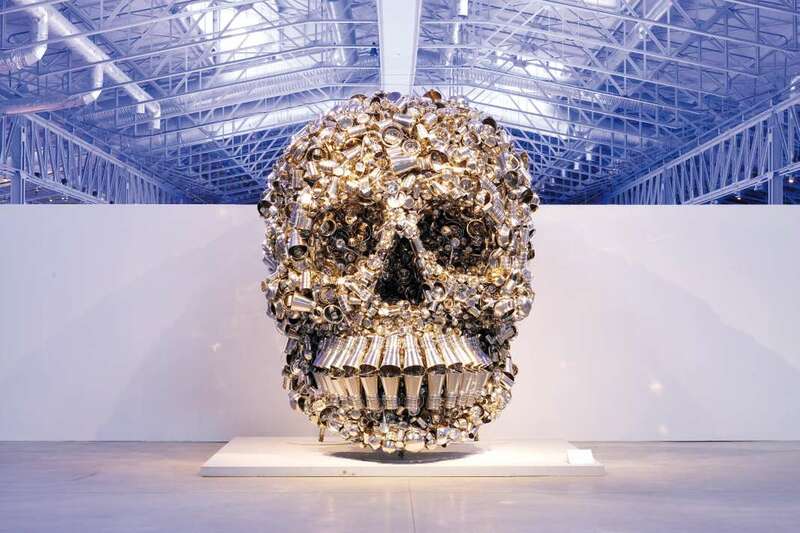 “I was deeply impressed by Subodh Gupta’s ‘Very Hungry God’ installation. It is a skull made of kitchenware. In my opinion, it is one of the greatest works of modern art. Gupta is one of my gurus, one of the people in the world whose art I worship,” he said. Datuna, who migrated to the US from the former Soviet Union, became famous globally post-2000 for his installations made of optical lenses, particularly the flags of 70 countries, including India. The Indian flag has been exhibited here at the India Art Fair. He is widely known for his “Viewpoint of Millions” series that explores the sources and meaning of cultural identity from each unique point of view. The technique used is a network of positive and negative optical lenses suspended over a collaged and painted image that includes mixed media like photography, newspaper clippings and paint. According to Datuna, the lenses symbolise individual identity, illusion, perception, fragmentation and unification. “At the very beginning, when I was totally unknown and in constant search of galleries to support me, I just needed a job. I found it in an optics store. I worked there for many years, selling, manufacturing, cutting the glasses and now I know everything about optics. Lenses for me are an equivalent of colours for other artists,” he said. There is a factory in China with the American artist as its only customer. “We use more than a million lenses per year for all the pieces of art we make,” Datuna said. His works have been exhibited in Europe, Russia, China and the United States. In 2011, his portrait of Russian President Vladimir Putin made out of miniature images of Mona Lisa was sold for $269,000 at the Art Moscow Fair. In 2013, he became the first artist in the world to incorporate Google Glass into a work of art. It was an American flag covered by pairs of glasses on which Google Glass projected images and videos of important moments of US history. The artist, who describes his work as “a political, cultural and commercial commentary on our current collective consciousness” unveiled his “Make America Stronger Together” installation in October 2016 at the doorstep of Trump Tower in New York. He had earlier flown both the then US Presidential candidates, Donald Trump and Hilary Clinton, to the Statue of Liberty for an art performance connected to the installation. “For me it is important to start this installation series in Russia because the pressure currently being put on it by the international community is both excessive and misguided,” Datuna said. “We do not need a world without Russia. Likewise, we do not need a world without the US, India or any other country. I will use my art and my installations to show that peace is more appealing than war,” he added. According to the artist, India deserves to play a more significant role in the global arena. “India shall get permanent membership of the UN Security Council, to say the least. Indian philosophy, and Mahatma Gandhi’s nonviolent practice in particular, could contribute a lot to the resolution of global conflicts,” he said.